When Superstorm Sandy slammed into the U.S. East Coast last October, it was the latest in a series of “teachable moments” about our growing vulnerability to climate change. Importantly, the storm has sparked a new conversation about our need for greater resilience in the face of disaster. It’s a timely conversation: While disasters of all kinds are nothing new, the frequency, scale, and impact of today’s disasters are greater than ever. The number of people affected by natural disasters exploded over the last century, from just a few million in 1900 to roughly 300 million in 2011. The global reinsurance firm Munich Re says 2011 was the costliest year ever for the insurance industry. 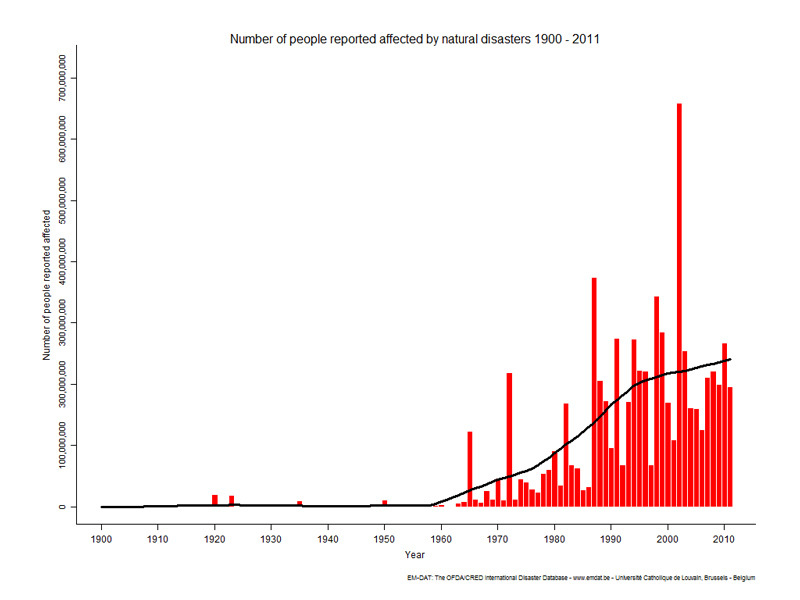 Human-made calamities are also on the rise. Today the world’s people are linked as never before by dense global networks of commerce and information – and those networks can amplify disturbances. For example, the ongoing financial crisis was triggered by risky mortgage lending in the United States, but in an interconnected global economy, its impacts reverberate around the world. Yet while disasters of all kinds are increasingly inevitable, it is possible to limit their impact. Some people, communities, and nations are able to weather and rebound from substantial shocks; they are, in a word, resilient. But what exactly does that mean? What characteristics confer resilience, and how can they be cultivated? Diversity and Redundancy. A system with diverse components will have a wide range of responses to a disturbance and is therefore unlikely to fail all at once. For example, a city with a diverse economic base, such as San Francisco, is less vulnerable to economic upheaval than one that relies on a single industry, such as Detroit. Similarly, a resilient system has multiple ways to perform basic functions, so that the failure of any one component does not cause the entire system to crash. Modularity. Modular systems, in which individual units retain some self-sufficiency when disconnected from larger networks, will fare better in times of crisis. For example, people living in a community with a robust local food culture (nearby farms, a farmers market) will be less likely to go hungry if there is a disruption in larger supply chains. A distributed energy system, in which individual households and communities produce as well as consume power, is much less vulnerable to grid failures than a centralized system. Reserves. Healthy resource reserves can help any system weather disturbances. Not surprisingly, wealth matters: hence the Japanese were able to recover fairly quickly from the devastating earthquake of 2011, while Haitians are still struggling to rebuild after the much smaller quake they endured in 2010. But money isn’t everything. One study of resilience to climate change found that, in addition to wealth, resilience depends on “environmental capacity” – the integrity of ecosystems – as well as on “civic and human resources” – the health, education, and economic capacity of a society’s citizens. Social Capital. Resilience is reinforced by “social capital.” For an individual, social capital is about relationships with family, friends, and colleagues. In communities, social capital can be measured by levels of trust, the strength of social networks, and the quality of leadership. At both the individual and community levels, social capital promotes resilience. For example, college freshmen with large social networks have stronger immune responses than their isolated peers. And communities with abundant social capital are better able to withstand and recover from disaster. Agency. The capacity to make choices and enact them in the world – agency – is central to individual and social resilience. Resilient people have a sense of control over their destiny; resilient communities fully engage their citizens in decision-making. Agency is clearly related to the capacity to adapt and thrive in the face of environmental and other changes. Fundamentally, agency is about power – personal and political. In a resilient society, power is not hoarded at the top, it is distributed broadly. The devolution of power is a moral imperative, and it has practical benefits: Capable, empowered people are better able to cope with all manner of crises, from job loss to tsunamis. Inclusiveness. Inclusive social institutions – economic, political, and cultural – can strengthen resilience at every level. As economist Daron Acemoglu and political scientist James Robinson have argued, societies thrive when they develop inclusive institutions that distribute power and opportunity broadly. They fail when those institutions become “extractive,” serving to concentrate power and opportunity in the hands of a few. Tight Feedbacks. A resilient system has “tight feedbacks,” which enable it to quickly detect changes in its constituent parts and respond appropriately. Tight feedbacks mean that the consequences of our actions are immediately apparent. When feedbacks are loosened, mistakes are easily made: it is easier, for example, to spend assets that you do not have using credit rather than cash. For most of human history, tight feedbacks defined the human relationship with the natural world. If a community overexploited a fish stock it depended on for food, the stock would crash and people would go hungry. Communities learned to heed those signals and develop institutions to manage common resources sustainably. Over the centuries, however, humans have loosened critical feedback loops – a process that accelerated dramatically over the last century with the expansion of capitalist market economies to every part of the globe. The result has been a profound loss of resilience – both ecological and social. Innovation. A resilient system generates novel responses to changing conditions. In nature, this is accomplished by evolution; in human society, it requires innovation – the ability and willingness to try new things. The capacity to innovate derives from many of the qualities just described. Diversity, for example, generates more novelty than uniformity does. An inclusive society with reserves of civic and human resources is better able to engage the agency and creativity of all of its citizens. And tight feedbacks provide timely and accurate information about changing conditions, which is essential for appropriate innovation. Resilience isn’t free; it sometimes comes at the expense of other qualities a society may value. The most glaring trade-off is between resilience and efficiency. Our industrialized market economy, which favors globalized, “just-in-time” supply chains, is efficient from a profitability perspective, but staggeringly vulnerable to disruption. The efficiency conundrum brings us to the problem of scale. The globe-spanning monocultures that supply us with food and other essentials may indeed be more vulnerable than diversified, decentralized systems. But there are now 7 billion people on the planet, and by mid-century our numbers will grow to anywhere from 8 billion to nearly 11 billion. Is it possible to build resilience into systems capable of sustaining eight billion or more? That remains an open question. At the same time, the resilience imperative might argue for voluntary measures to slow population growth, especially since the most effective of those measures – educating girls, empowering women, and ensuring access to reproductive health services – could themselves promote resilience. The prescriptions for resilience cited earlier are sometimes at odds with each other. For example, open societies are good at fostering innovation, but they are also vulnerable to terrorists and other “rogue” actors. Diversity promotes innovation, but sometimes at a cost to social cohesion. And social cohesion can be protective, but it can also discourage innovation and adaptation. One thing, however, is clear: A world designed to weather shocks and disturbances would look very different from the one we now inhabit. The systems that supply us with food, electricity, and other essentials are not diverse and modular; they are massive monocultures that, as they grow ever more efficient, also become more vulnerable. The natural reserves that could protect us from ecological disaster are declining. Poverty and discrimination inhibit individual agency and problem-solving capacity, while inequality weakens social cohesion. And in a thoroughly globalized economy, the feedbacks that warn of impending disaster have gone slack. The need to withstand disaster offers a powerful reason to change. But how can we apply resilience thinking in our own lives, and in our communities and societies? Those are the questions we will explore in the next post in this series, Toward Resilience. This post was adapted, with permission, from Mazur’s chapter in the forthcoming State of the World 2013 report by the Worldwatch Institute. Sources: Acemoglu and Robinson (2012), Aldrich (2012), Annual Review of Environment and Resources, Bloomberg Business Week, Diamond (2011), EM-DAT, Gunderson and Holling (2001), Health Psychol, Heinrich Böll Stiftung, Institute for National Security and Counterterrorism, Lloyd’s, Munich RE, National Hurricane Center, The New York Times, U.S. Department of Energy, The White House, Zolli and Healy (2012). 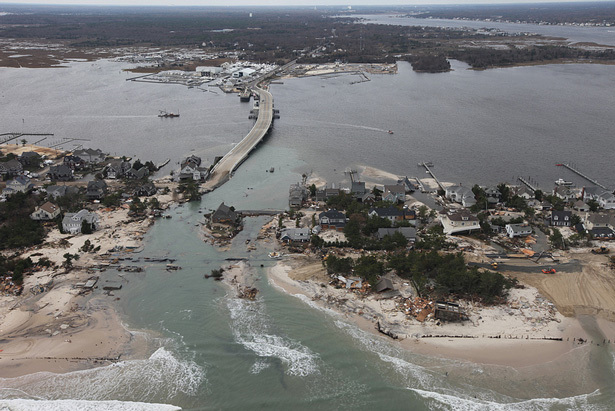 Photo Credit: “Storm damage along the New Jersey coast,” courtesy of the U. S. Fish and Wildlife Service. Chart: EM-DAT.